One famous nautical superstition has sailors looking to the evening skies to determine the weather for the next day. A colorful sunset with red skies meant the seas would be calm and the weather favorable delighting the sailors. What will the artist's canvas look like tonight as the final sunset is painted in the evening sky? Let's hope that the sunset signals calm seas with favorable conditions for the coming year. Early in 2010, a major earthquake hit Haiti killing or injuring hundreds of thousands, causing billions of dollars of damage, and devastating this already struggling nation. The cruise industry and others rallied to try to help the country following the disaster. Royal Caribbean, who has a long-standing relationship with the government of Haiti, led the cruise industry response (even while being criticized). The nation would later suffer additional loss of life and damage when a hurricane struck the country. 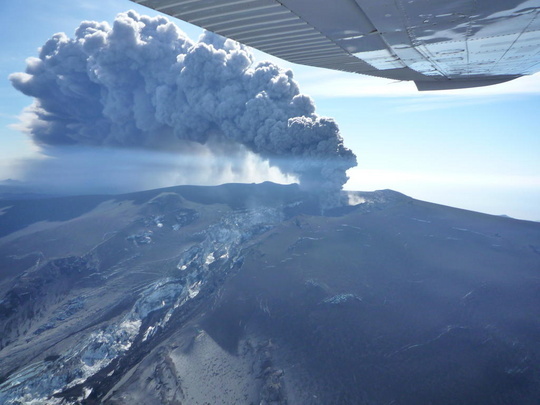 Later in the year, the world's eyes turned to the skies over Iceland as volcanic ash grounded flights over Europe disrupting travel across the entire world. Passengers were stranded in airports for days until the ash cleared. Some passengers were unable to get to their cruise ships on time while in other cases, the ships provided an alternate means of travel for stranded air passengers. It was a logistical nightmare for the entire travel industry and put additional strain on the economy. Hurricane season began with a vengeance and it was feared that the NOAA predictions of a higher than normal season would become a reality. There were a larger than usual number of named storms and hurricanes, but fortunately, they didn't produce the devastation of years past. That doesn't mean that there wasn't any loss of life or property damage. As mentioned, Haiti did have substantial damage as did St. Lucia and other Caribbean countries. 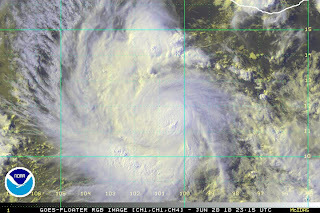 Cruise itineraries were changed as storms approached or in their wake as services were restored. During the height of hurricane season, an explosion on an oil rig caused loss of life and a major oil spill that would consume resources from the federal government and other agencies. 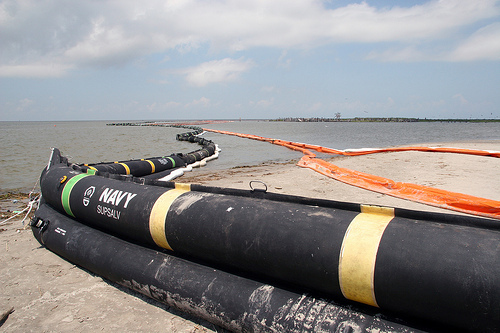 The spill severely endangered the ecology of the Gulf Coast region. It took months to clean up and the effects of the spill will remain for many years to come. Cruises were not impacted during the spill as the impacted ports remained open. Despite the continued cruise line presence, the economic impact from the oil spill took its toll on the region. Many people changed their vacation plans as the cleanup continued. The most recent major event of 2010 was the engine room fire on Carnival Splendor which stranded passengers on that cruise and impacted vacation plans through February next year. The good news is that the industry will learn from this event and become even safer. 2010 saw the introduction of several new cruise ships including Costa Deliziosa, MSC Magnifica, Celebrity Eclipse, P&O Azura, Norwegian Epic, Seabourn Sojourn, Holland America Nieuw Amsterdam, Cunard Queen Elizabeth, Royal Caribbean Allure of the Seas, and Disney Dream. The introduction of these new ships means there are more choices for the consumer. As demand continues to increase, the capacity is keeping pace assuring that a cruise vacation is well within the realm of possible vacation choices. While the economy and disasters have been front and center all year long, passengers are returning to cruising and we anticipate prices will rise as 2011 pricing comes out. There might be some time yet to take advantage of lower prices, so it is wise not to procrastinate. Just like 2009, we saw an increase in first-time cruisers and those that have tried cruising continue to return year after year. 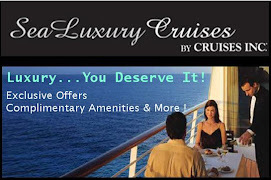 A cruise vacation remains an extremely good value making it a wise choice for those that decided to take a vacation. Let us close the book on this historic year together. Tomorrow, when you awake, open the book on what I hope will be a brighter tomorrow. Happy, Healthy, Prosperous New Year to all!! 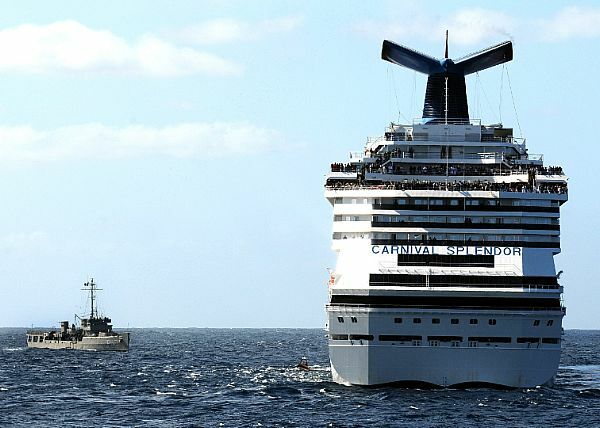 The USCG has released CO2 system safety concerns in the wake of the Carnival Splendor fire. The investigation is ongoing, but the following two reports discuss preliminary findings and associated recommendations. extinguished by the vessel’s quick response team firefighters using portable extinguishing equipment. started, the master of the vessel made the decision to release CO2 from the vessel’s fixed firefighting system. It failed to operate as designed. Subsequently, crew members were unable to activate it manually and CO2 was never directed into the machinery space. " Ensure that all supporting documentation, piping schematics, plans, manuals, component labeling and instructions are consistent with each other and relevant to the systems, equipment, and components installed onboard the vessel. Carefully and critically review, routinely inspect and maintain, verify and test their Fixed Fire Fighting installations to ensure that they will operate correctly during an emergency. Developed by the U.S. Coast Guard Headquarter’s Office of Investigations and Analysis, Washington, DC. Questions may be addressed to HQS-PF-fldr-G-PCA@uscg.mil. The cruise industry is carefully watching the investigation of the Carnival Splendor fire incident. It is hoped that through reports like the ones just released by the USCG, passenger and crew safety can be enhanced as a result. The industry takes safety very seriously and has an excellent record overall. Carnival Splendor's sailings have been canceled until February 20, 2011 as a result of the fire. Monday, December 27, will be delayed several hours. Carnival is advising embarking passengers to arrive after 1:30 p.m. The East Coast is being hit by a major snow storm which has stranded passengers in several states including New York and Boston. 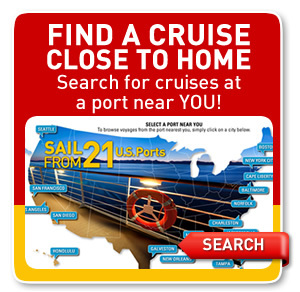 The closures won't directly impact cruises in that area since there are none scheduled to leave until January 2nd. Of course, passengers trying to depart from or through New York or Boston, will be impacted by the closures. Carnival Pride and Norwegian Jewel were not impacted by the snow storm. They departed on schedule Sunday afternoon. It is always advisable to allow extra time for travel to your port of call, especially during winter months. Check with your air carrier in advance to see if there are any changes to your flight schedule. 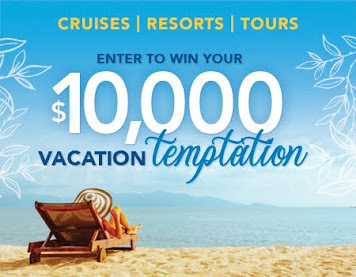 The cruise line will notify your travel agent of any known itinerary changes, but last minute changes can also occur. Best advice is to expect changes and have travel insurance to assist you with any missed connections. Allure of the Seas - Move It! Move It! Everyone likes a parade! Join all your DreamWorks movie friends on Allure of the Seas Royal Promenade for a parade like non other you've seen before on a ship. 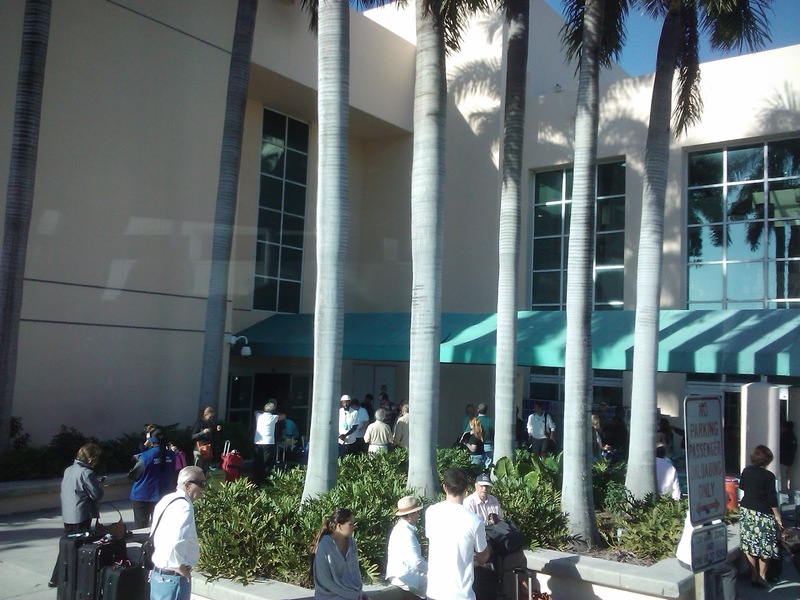 Passengers line up all along the promenade for a look at the parade. While there isn't a bad spot along the route, some spots have a slightly better vantage point, especially of the stages that are along the way. The restaurants along the route are the first to fill up as passengers grab seats for the parade. It is possible to move some of the stools and get a front row seat for the parade. You'll want to line up for the parade at least 30 minutes in advance to find a good location. The parade starts out with some overhead action, as a platform unfolds near the Cupcake Cupboard. When scouting out your viewing location, take the stages and overhead stages into consideration so that you don't miss any of the entertainment. The following video shows some of the action from the parade. The costumes are very colorful and there's plenty of action to keep you interested. More videos and photos can be found on our Facebook Fan Page. Make sure to like us. As I gaze out the kitchen window this morning, I see a white blanket of snow covering the ground and nearby trees. The snow began falling late last night just in time for a White Christmas. Looking at the untouched snow, everything looks quiet and peaceful. Images like this usually stay with you for some time and when you close your eyes, you can sometimes see them again as if you were seeing them for the first time. We've had the good fortune of being able to add other images to our memory banks this year. The tree in this picture decorated one of Azamara Journey's lounges. The crew had just started decorating for the holidays on the final day of our 12 Night West Indies voyage. We had hoped that they would have decorated sooner, but they told us it was too early. The voyage following ours would be the first one that had the holiday decorations. Prior to our Azamara Journey cruise, we were onboard the Allure of the Seas for a pre-inaugural cruise to nowhere. This picture of the glass elevators shows some simple holiday decorations. Decorations play an important role in helping people get in the holiday spirit. 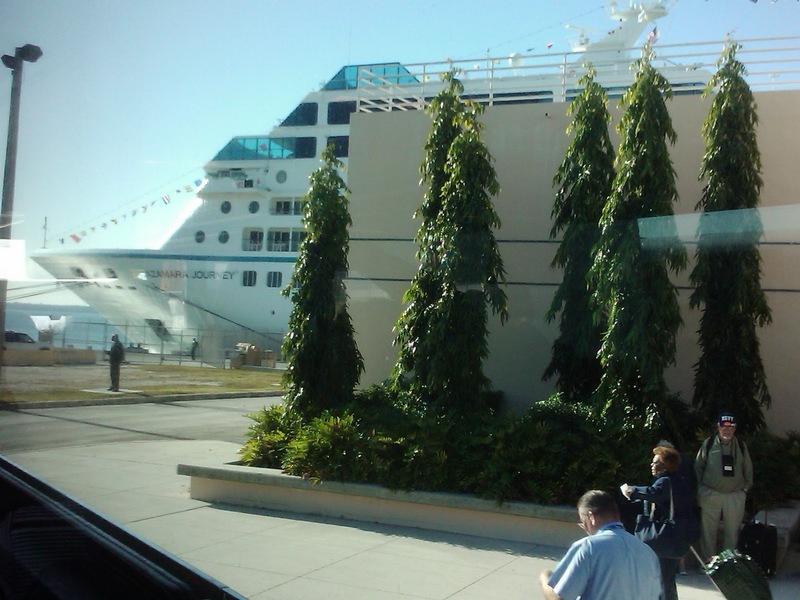 For the cruise ship's crew, the holidays are business as usual as they go about assisting passenger's needs. We sometimes forget that they are away from home for long periods of time. We had dinner with the Captain of the Azamara Journey one night. We learned that he was heading home after spending three months at sea away from his family. He was excited to be heading home for Christmas to spend time with his young child and wife. Holidays are a time for family and friends. My wish for you this Christmas Day is that you are sharing the day with those that you love and care about, and who have mutual feelings for you. For those that are away from home, such as cruise ship crew and those serving their countries in the armed services, may the peaceful images in your mind help you to be close to those you love, if only in your heart and mind. People read this blog from all over the world, so I don't know if you are looking out your window and seeing snow like I did, or perhaps a sandy beach that has just had the tide wash back out to sea leaving a peaceful image of untouched sand. Whatever images you are seeing, may they sustain you and bring you peace on this Christmas Day. 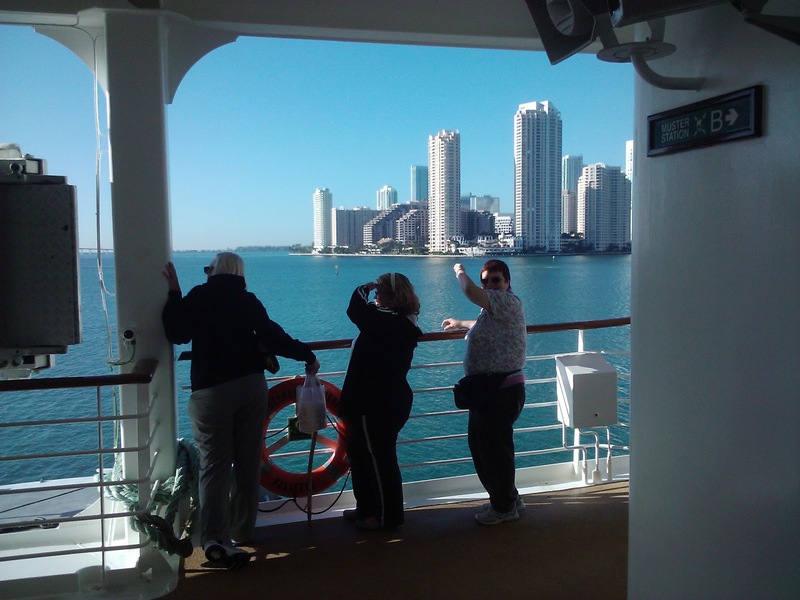 Thank you for allowing me to be a part of your lives by sharing our adventures and cruise industry information. 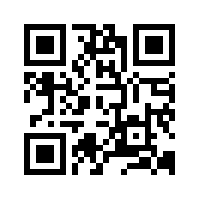 My blog and facebook fan page are my gifts to you. I hope you enjoy them. Merry Christmas to all. Carnival Cruise Lines has announced additional cancellations of Carnival Splendor. The January 16, 23, 30 and February 6 and 13, 2011, voyages were canceled to allow for additional repair time following the engine room fire aboard the vessel in November. Carnival's statement indicated that as the repairs have been progressing, additional problems were uncovered requiring additional repair time. In addition, some parts were unavailable and had to be manufactured in Europe. The ship is currently in San Diego, however, it will sail to San Francisco in mid-January where repairs will be completed at a dry dock facility. "We sincerely apologize to our guests for having to cancel these additional cruises," said Gerry Cahill, Carnival's president and CEO. "We made our best effort back in November to estimate the necessary repair time with a strong goal of not having to modify it at a later point in time. Unfortunately, as the repairs have progressed and we have discovered additional issues, it is now clear that we need more time. We know this is extremely disappointing for our guests and particularly disheartening for those who already had their vacations cancelled once and are now being affected again." As has been the case with the earlier cancellations, guests booked on the cancelled voyages will receive a refund or future cruise credit equal to the amount paid, along with reimbursement of air transportation-related change fees. Those who re-book may also receive a 25 percent future cruise discount and/or onboard credit depending on the ship and sailing date of the new booking. Additional details can be found in Carnival Splendor's Travel Advisory statement. While this is disappointing, Carnival Cruise Line has once again tried to accommodate guests impacted by this accident. We all look forward to the day when Carnival Splendor will once again be sailing the seven seas with passengers enjoying the repaired ship. Gator Park in the heart of Florida's Everglades National Park was our post-cruise destination for a few hours before heading to Miami International Airport. 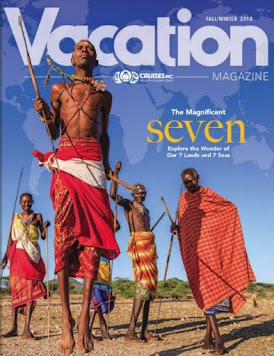 The shore excursion was arranged during our West Indies cruise on Azamara Journey. Since our flight wasn't until 5 PM, instead of going directly to the airport, we opted for the shore excursion. Florida Everglades is home to hundreds of bird species as well as thousands of alligators, and crocodiles. During a visit to Gator Park, you'll get up close views of alligators and bird species for certain and you may have an opportunity to see some of the other inhabitants in their natural setting. The highlight of the excursion to Gator Park is a 45 minute airboat ride through the Everglades. Each airport holds up to 20 people, 4 per row. Every seat is a great seat. While your guide will be pointing out alligators and other things of interest along the way, each person has the opportunity to be on the lookout. You never know what you'll see during your boat ride. You'll be able to stand up when the pilot / guide slows down to point out alligators or other marine life. Weather plays a role in how active the alligators and other wildlife are in the park. The weather had been on the cool side for several days, and the alligators were a little sluggish. That was fine for us since that provided plenty of opportunities for us to see them coming out for some sun on this gorgeous day. We've been to Gator Park before but still enjoyed our visit there. Following the airboat ride, we had some lunch, which we ordered when we arrived at the park. Then we watched a wildlife show which included alligator wrestling and if you were feeling brave, you could actually hold an alligator and have your picture taken with it. Actually, you didn't have to be too brave as the alligator's mouth was secured so that you didn't have to worry about being its lunch. There are more pictures on our Facebook Fan Page. If your flight leaves after 3 PM, consider a shore excursion to Gator Park if your cruise offers the tour. Another option on our cruise was a Miami City Highlights tour. 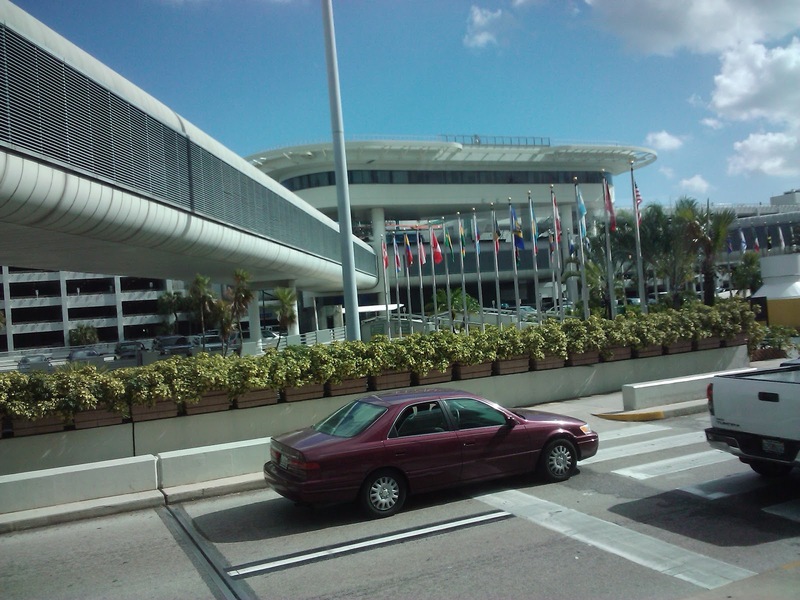 Both tours concluded at Miami's airport about the same time. We still had plenty of time before our 5 PM flight, but did enjoy our little diversion visiting the gators of Florida. Today is the dreaded final day of our back to back cruises. 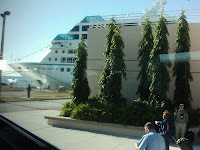 Seventeen days ago we left the cold of Chicago behind and headed to sunny Florida for our pre-inaugural cruise on Royal Caribbean's Allure of the Seas which was followed by one day in Miami and this 12NT West Indies cruise on Azamara Journey. Both cruises were amazing in their own way. As usual, my ever vigilent husband somehow managed to capture most of the highlights of our cruises. In this photo, he caught two of our companions and I out on deck 5 of the Journey watching a pod of dolphins playing near the ship. We had spotted them through the cafe window as we were having breakfast. Our friends hadn't seen them, so we told them to go out on deck to see if they were still around. Low and behold, they were still there, thrilling anyone that was fortunate enough to be gazing out at Miami's skyline in the background. Sailing into Miami is always a treat early in the morning. The sun glistens off the tall buildings and reflects in the water. I'll post some more Miami skyline pictures on my Facebook Fan Page when I get a chance. I think you'll enjoy them. This portion of Miami's skyline has been made famous by the CSI Miami television series. We booked late flights (around 5 PM) for our return home. It is always a good idea to book flights after noon of disembarkation day because you never know how long it will take to clear the ship. Before anyone can disembark, non-US Citizens must clear through immigration on board the vessel. Sometimes, the staff needs to make repeated announcements for guests to be cleared. The thought of hanging around MIA airport for 6 hours or more didn't thrill us, despite it being a nice airport. 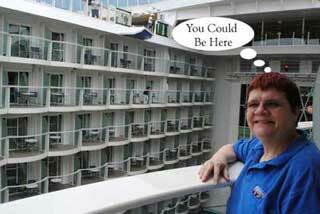 We booked a post-cruise tour through the shore excursion desk. We were given luggage tags, Lavender 1, which meant we'd be one of the first groups off the ship. Basically, only people with early flights disembarked prior to us. Once off the ship, we claimed our luggage, which was quite easy to find in the small number of passengers which were on the bus tour along with us. We didn't need a porter this time, so we proceeded directly to Customs, gave them our passports and form and were on our way outside to one of the waiting buses. The shore excursion we selected was a visit to Gator Park where we would have the chance to take a 45 minute air boat tour through the Everglades and then an interactive show which included the opportunity to hold an alligator if you liked. We've been to Gator Park before, but this is one of those places where you can visit more than once and enjoy yourself. Whenever you are dealing with nature, you can guarantee you'll have a different experience - you never know what you'll see. I'll feature Gator Park in another post and also post pictures on our Facebook Fan Page. This is a fabulous tour which is perfect for occupying a few hours before you return flight. Our bus pulled into Miami International Airport around 12:30 PM or so. 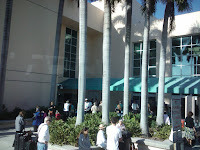 The driver made two stops at each of the main terminal locations, unloaded the bags, and sent us on our way. As you can see, we still had several hours to kill at the airport, but at least we'd had a fun experience speeding through the everglades in an airboat and watching the amazing wildlife that inhabits the Florida Everglades. There was also a city highlights tour that we could have selected. 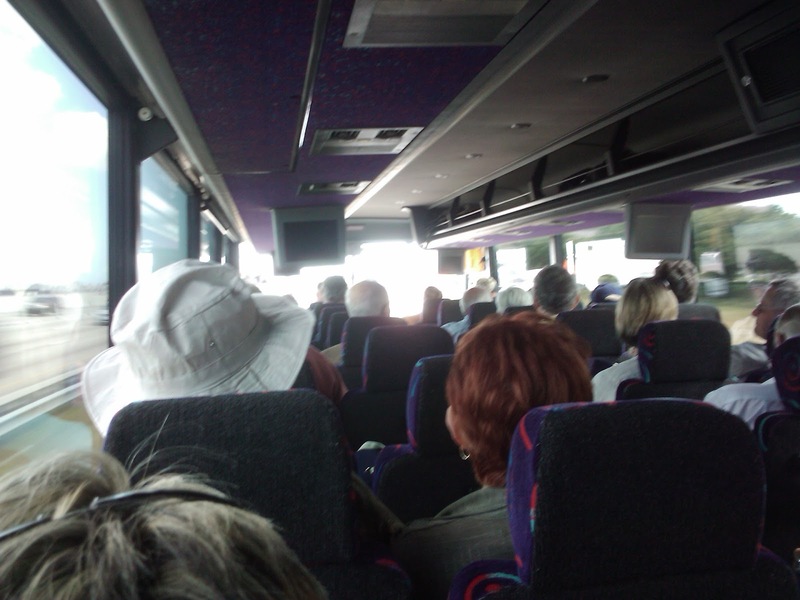 Some of the passengers picked that excursion but regardless, both tours ended at the airport about the same time. Sadly, this ends our current cruise adventure. 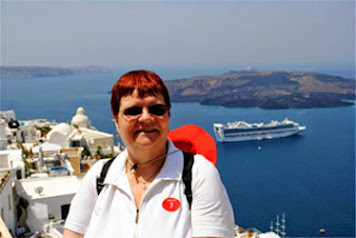 We've had a wonderful time on both cruises and will be posting additional blog articles and more pictures. There is just so much to share with my readers, it was hard to select a sample to get started. I hope you come back often to see what other stories I have for you. If you have questions, feel free to contact us. The final chapter has been written on the Disney Dream's construction as shipbuilder MEYER WERFT turned over the keys of the new ship to Disney Cruise Line December 9th in Bremerhaven, Germany. Following maritime tradition, the MEYER WERFT flag was lowered, while the Disney Cruise Line flag was raised, transferring ownership from the shipbuilder to Disney Cruise Line. Construction began nearly two years ago in Papenburg, Germany. The delivery signals its readiness to welcome guests on its maiden voyage, set for Jan. 26, 2011, from Port Canaveral, Florida. The Disney Dream will depart for Florida on December 19th after crew and provisions are loaded on the new ship in Germany. From a water coaster at sea called AquaDuck, and inside staterooms with virtual views, to Enchanted Art that immerses guests in stories, and fine dining at Remy’s, the Disney Dream will deliver family cruise experiences like no other. The shipboard experience remains focused on the legacy and heritage of The Walt Disney Company’s most known assets – master storytelling, world-class entertainment and legendary guest service. Those of us in the travel business call this the "Disney Difference". The Disney Dream adds to the list of completed vessels in 2010. We believe this will be one of the years that stand out in cruise industry history as a year of innovation that takes cruise vacationing to a new level. The Disney Dream is scheduled to depart on Dec. 19, for its transatlantic voyage to the U.S., with an expected arrival on Jan. 4, 2011. 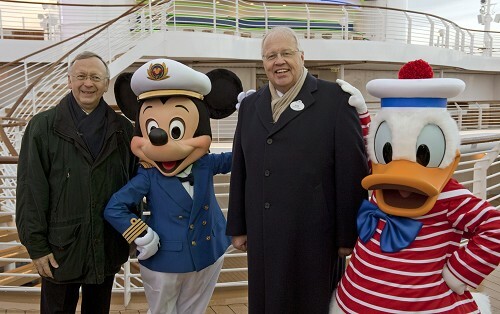 Captain Tom Forberg will officially take the helm of the Disney Dream for Disney Cruise Line. As part of the Disney Cruise Line ship construction team, Captain Forberg has been with the company for 15 years and was responsible for launching Disney’s first two ships, the Disney Magic and Disney Wonder. The Disney Dream is scheduled to sail three-, four- and five-night cruises to the Bahamas, from Port Canaveral. Sister ship Disney Fantasy is currently in production at the MEYER WERFT shipyard and is scheduled to set sail on its maiden voyage on April 7, 2012. 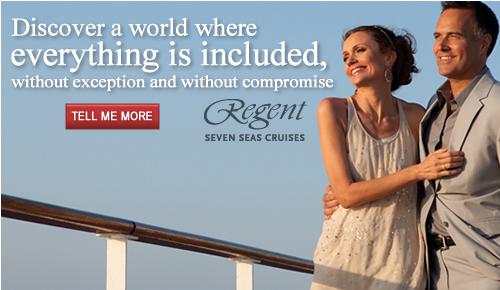 It will sail seven-night alternating eastern and western Caribbean itineraries, also from Port Canaveral. Congratulations Disney Cruise Line on another family vacation choice which will continue Walt Disney's legacy for many years to come. It's hard to believe it all started with a mouse. Today we celebrated my birthday at sea on Azamara Journey. It was a wonderful day from start to end. While I slept, my husband had decorated the cabin with a Happy Birthday banner he purchased in St. Barth. He also put a banner on the door. We went for breakfast in Windows Cafe. Following breakfast, we headed to the Discoveries Restaurant where the Grand Buffet Brunch was being served. We took a few pictures and planned to return for lunch. The reason we did things this way was that we had an Engine Control Room tour at 11 AM and wouldn't have time to leasurely enjoy the brunch otherwise. The tour was fascinating as this was the first time seeing an engine control room on a ship this size. The chief and staff have the responsibility of making sure everything runs smoothly. Obviously, they monitor the engines, but there is so much more that is controlled by the power generated onboard. The most important thing is keeping the temperature within the proper range for all the various ship's components. When we returned to our cabin, our cabin steward, Valentina, and her helper, Jose, were there to greet us. While we were at breakfast, they had made up our cabin and added more to the decorations. They added balloons on the door and on the bed. There was a certificate wishing me a Happy Birthday. They wished me a Happy Birthday and we chatted for awhile. They have been great throughout the entire cruise. It was now time to head back to Discoveries for brunch. Since we are Discoverer Members of Le Club Voyage (the highest ranking for the loyalty program) we had a reserved table for brunch. We sat with the guests who had joined us for dinner with the Capatain earlier in the voyage. This time, we were joined by Staff Captain Aris for a most enjoyable brunch. Captain Aris arranged for the 8 of us to join the bridge tour at 1:30 PM, so we next headed to the Looking Glass on deck 10 where the tour gathered. I'd missed the tour the other day due to a meeting, but my husband had gone and taken pictures. Following the tour we went to change into our bathing suits and laid out on the spa deck which is where the thalassotherapy pool is located. We stayed up there for a few hours and then it was time to get ready for the evening's festivities. First up was a Le Club Cocktail Happy Hour in the Looking Glass. From there we headed across the deck to Prime C for dinner with another couple we met on the cruise. We had invited them to join us for my birthday dinner. We had a fabulous time at Prime C. I'll cover that in a separate post, as that deserves its own treatment. As usual, the evening entertainment was in The Cabaret on deck 5 at 9:45 PM. Tonight's entertainment was entitled "Broaway Showtoppers". The musical arrangements and direction were by Eric De Gray, our Cruise Director. He starred in the performance along with the Journey Singers and Dancers and the Boys in the Band. Once again, it was a fabulous show since the entertainment on the Journey is one of the best at sea. Despite the fact that we were gaining an hour of sleep tonight as the clocks are set back to Eastern time, I was tired and decided to retire to bed following the show. One more sea day and then we will be back to Miami. Check out my Facebook Fan Page for more pictures. Welcome to Central Park, a neighborhood where you can enjoy nature or indulge your cravings for something tasty from one of the quaint shops along the path. Strolling through Central Park, we decided to have some more lunch. Unlike other cruises, we had decided not to have a sit down meal in the buffet, but rather to try one or more of the dining venues. One of the best kept secrets is Park Cafe's Signature sandwich. It is slow roasted beef on a bun with au jus. If you wanted, you could order a panini sandwich or even have a salad made to order. As the name suggests, service is buffet style. There are several counters to chose from, so take your time and select one or more of your favorites. We highly recommend the English Toffee cookies and other pastries to complete your meal. For more pictures, see our Fan Page on Facebook. There is much to tell about the Allure of the Seas. Central Park is just one of the locations where you can find a quick bite to eat or have a relaxing meal. We will continue our coverage of Allure of the Seas on our blog and Facebook page, so be sure to check back to see what else we've added.